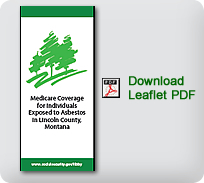 Depending on your family's income, additional assistance through the Medicare Savings Program with your state. Present in Lincoln County, Montana for a total of at least six months during a period ending 10 years or more before the diagnosis. To qualify, you do not need to be age 65 or receive disability benefits. In addition, there is no waiting period, and you do not need to have worked and paid into Social Security or Medicare. Find an answer to your question here!